Go ahead and register, you know you want to. 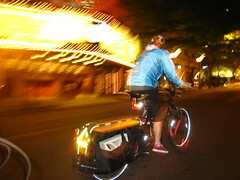 It’s the most fun you’ll have on a bike in the middle-of-the-night all year, I guarantee it. 2012 will be our third-annual 9-5. We’ve confirmed all of our team members (who know better than to back out at the last minute) so we’re all set. The first year Tim had to talk me badger me into participating. I believe he called me old. and I’m pretty sure he called me boring. That was all it took: hey man, don’t you dare call me boring. At year 3, the 9-5 has become our annual Father’s Day tradition: it’s my gift to Tim. We ride, we laugh, we collect lots of stuff, we laugh some more and we ride some more. And the next day, I let him sleep in. What more could a guy want? Go ahead and register. We’ll see you at Gasworks around 8:00! This entry was posted in bikes, Events, extravehicular activities, xtracycle and tagged 2012, 9-5, go means go, June 16, seattle, Solstice, up all night. Bookmark the permalink.